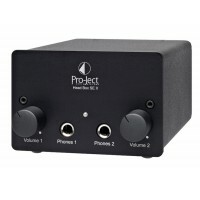 HD-DAC1 Serious Hi-Fi quality USB-DAC and Headphone Amplifier. Elegant classic look in a compa..
Naim HeadLine 2 Headphone Amp Engineered for music HeadLine The HeadLine i..
Pro-Ject Head Box DS USBHeadphone Amp D/A converter & headphone amplifier &nbs..
Pro-Ject Head Box RS Headphone Amp Highend headphone amplifier ..
Pro-Ject Head Box S Headphone Amp An Audiophile Bargain! Head Box S ..
Pro-Ject Head Box S USBHeadphone Amp Audiophile headphone amplifier Head Bo..
Pro-Ject Head Box SE II Headphone Amp Headphone Amplifier Head Box SE ..
Rega EAR Headphone Amplifier Exceptional performance EAR Headphone Amplifier New D..